After an ACL reconstruction, you will begin a long acl rehab process. While you may not be in formal rehabilitation for 6-8 months, you will have to do things on your own to build your strength, endurance, balance, and sports skills. The ACL rehab process spans several months, some of which can be filled with frustration. The first several weeks see lots of progress, with almost daily gains in range of motion, strength, and function. The following months have less noticible gains. The ACL reconstruction timeline presented below is only one protocol. It is the one that I used with my patients at the clinic, and is strongly supported in the sports medicine literature. You will find many different timelines, depending on your surgeon. Please follow your physicians recommendations as to the progression of your ACL rehab. During the immediate post-operative phase after ACL reconstruction you will be doing exercises at home, as well as attending rehabilitation at a clinic. It is extremely important that you undergo rehab in a supervised and formal setting. In the first few weeks, I work with my patients to restore their range of motion, strength, and balance. I work with them on their gait, and walking without a limp. Returning range of motion, especially active extension is the first priority for ACL rehab. With full active extension, you will be able to walk normally, and your swelling and pain will diminish much more quickly. It is the most important goal. Most people worry about being able to bend their knee. This motion will come back, but it does so much more slowly. As you continue to get stronger, it will improve. My patients continue to work on strengthening at home, and I update their programs every 3-4 weeks. This is important to make sure that they are progressing, and that they are not having any problems or setbacks. I won't get into the specific exercises that I have patients do, but I progress them to jogging at 12 weeks. By this time, they have little to no pain with daily activities, and are walking normally without the brace. Once they start jogging at 12 weeks, the process plateaus. You don't see any major timeline goals, and you just have to keep plugging away with your strengthening. At this time after the ACL reconstruction I start my patients on jumping activities. Specific exercises that are designed to get the knee used to the loading and unloading of jumping. Patients continue with their strengthening and jogging, and add jumping activities to the program. This is the most frustrating time of the ACL rehab process. You don't see much tangible progress day to day. You will be gaining strength and balance, but it isn't like the first few weeks when you notice an improvement everyday. At 5 months after ACL reconstruction, I start my patients on hopping drills. These are similiar to the jumping drills, but on just one leg. It progresses them to sports specific drills, and gets them ready for eventual return to play. They are working on higher level strengthening exercises like single leg squats, Romanian dead lifts, and other functional exercises. Most of my patients are able to return to full sports activities at 6 months. Some take a little longer to get back into the swing of things. The general concensus from our physicians is 6 months after surgery being the earliest they will return anyone to unrestricted activity. Before my patients can return to activities, they undergo a functional profile test. This compares their surgery knee to their uninjured knee. It is comprised of several different tests that measure strength, balance, control, and mobility. Once they pass this test, and are 6 months out from surgery, they are released to unrestricted activity. Bridging the gap between one on one rehab and return to play can sometimes be difficult. You may be given a home program, with some exercises to work on, but often times, you are left to continue strengthening on your own. The problem is that these home programs often don't progress you as far as you need to be before you return to sports. Which means that you are at risk for re-tearing once you do return. The final stages of rehab must contain exercises that train your body to prevent a re-tear of the ACL. Strength, balance, and muscle control are the key components of the last 2 months of rehab before release. 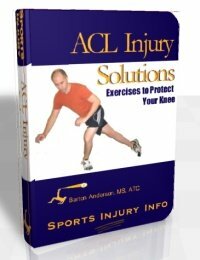 ACL Injury Solutions is a comprehensive 8 week program designed to help protect your ACL. It includes all of the best exercises for improving muscle control, balance, strength, and mobility - the same exercises I use with my own patients in their last months of rehab. If you are recovering from an ACL tear, are 4-5 months out from surgery, and want to be as strong as possible when you are released for sports, ACL Injury Solutions is for you. ACL rehab is a long process. It helps to be able to see the goals along the way, and to know when you will be able to do specific things...like get off your crutches, get out of the brace, start jogging, jumping, and return to play. Discuss with your surgeon their specific ACL reconstruction timeline. It may be different from the one above, it may be very similiar. Knowing when and how you should progress will set your mind at ease, and give you something to work towards.